Te Papa’s curator of terrestrial vertebrates Dr Colin Miskelly recently visited the Poor Knights Islands Nature Reserve, off the Northland coast, as part of a research team tracking the at-sea movements of Buller’s shearwaters. The project is led by Graeme Taylor of the Department of Conservation, and is intended to identify the marine environments used by these elegant seabirds, both when raising young and when on migration. Here, Colin illustrates some of the large invertebrates that also occur on the islands. The Poor Knights Islands are a treasure trove for large invertebrates, many of which have been wiped out by introduced predators on the mainland. The long isolation of the islands has also meant that some endemic species have evolved – i.e. species that only ever occurred on the Poor Knights Islands. 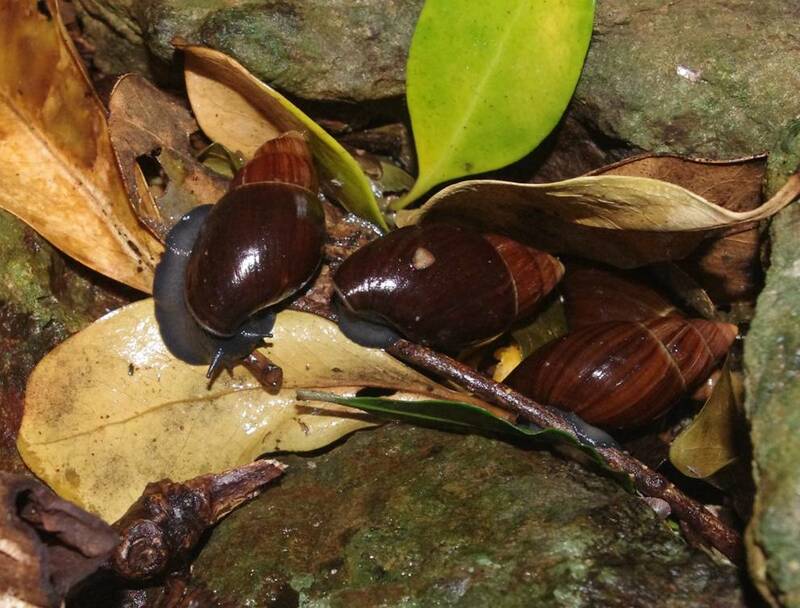 Flax snails were abundant under rocks and in seabird burrows, emerging on damp nights to graze on fallen leaves. It is thought that these large snails were introduced to the Poor Knights Islands from the Northland mainland by Maori. 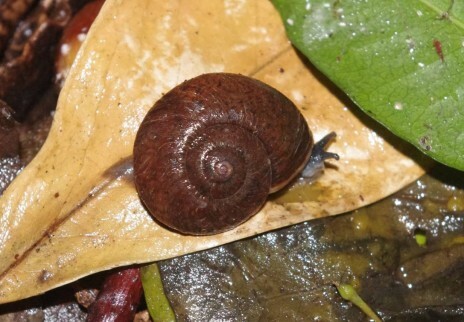 Amborhytida dunniae is a medium-sized carnivorous snail that also occurs in declining numbers on the Northland mainland. We found one among leaf litter on a damp night. One of the most surprising finds of the trip was a previously unknown large leaf-veined slug (family Athoracophoridae). 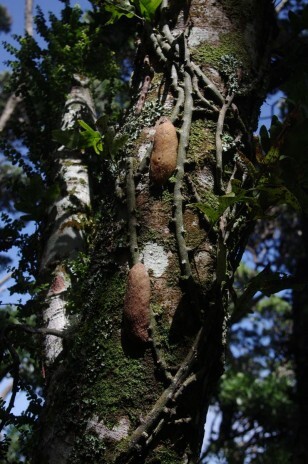 We found four large animals (10 cm long at rest) on the sunny northern side of a towai trunk on a hot summer afternoon. They had probably been caught in the open after climbing to the canopy during rain the night before. These impressive slugs proved to be a new record for the Poor Knights Islands, and are likely to be a new species in an as-yet unnamed genus. Two other similar species occur at Waipoua/Trounson in Northland, and Hikurangi in the Bay of Plenty. Giant centipede (Cormocephalus rubriceps). This large centipede (up to 25 cm) is widespread in the North Island and also in Australia, but reaches its largest size on rat-free offshore islands. 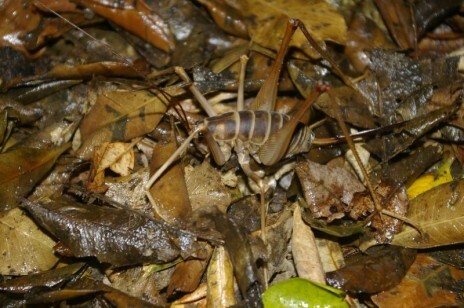 They were mainly seen on the forest floor at night, actively hunting for large insects and lizards. A few were seen in seabird burrows in the daytime, which we tried to block out of our minds as we reached in to extract shearwater adults and chicks. Poor Knights giant weta (Deinacrida fallai). 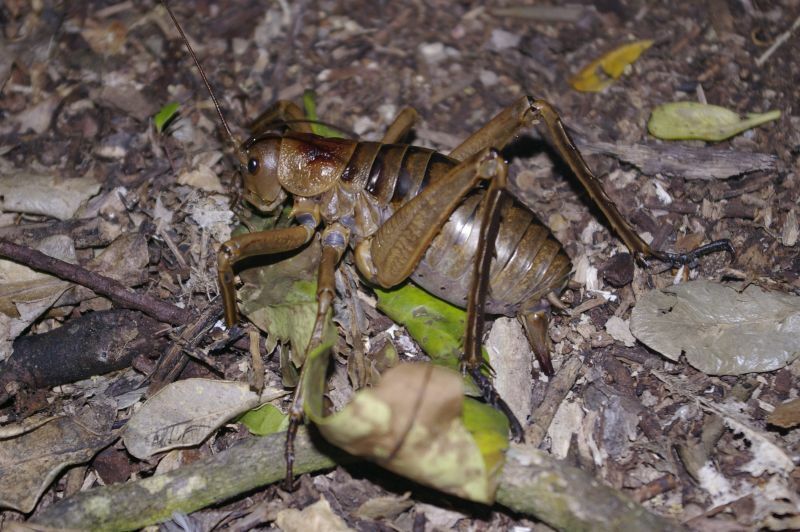 Second in size only to the Little Barrier giant weta, this is one of New Zealnd’s largest insects. One female we weighed was 49 grams. 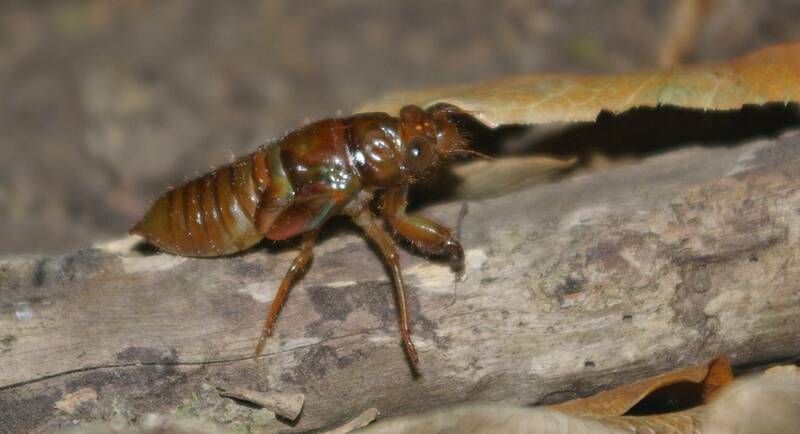 They stayed well-hidden during the day, but emerged at night to browse on leaves, and many females were seen laying their eggs in the soil of the forest floor. 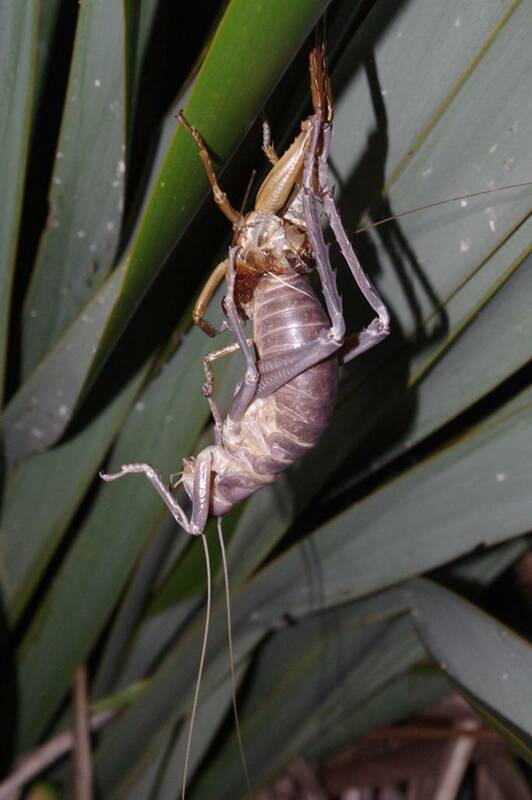 Like all insects, weta have to moult their hard exoskeleton in order to grow. The moulting female shown here was suspended upside down from a flax bush when first found. She then turned around and ate every last scrap of her old skin, recycling the precious chiton while her new skin hardened. By the morning there was nothing left of the out-sized exoskeleton, and the still pale newly-moulted female was hiding nearby. 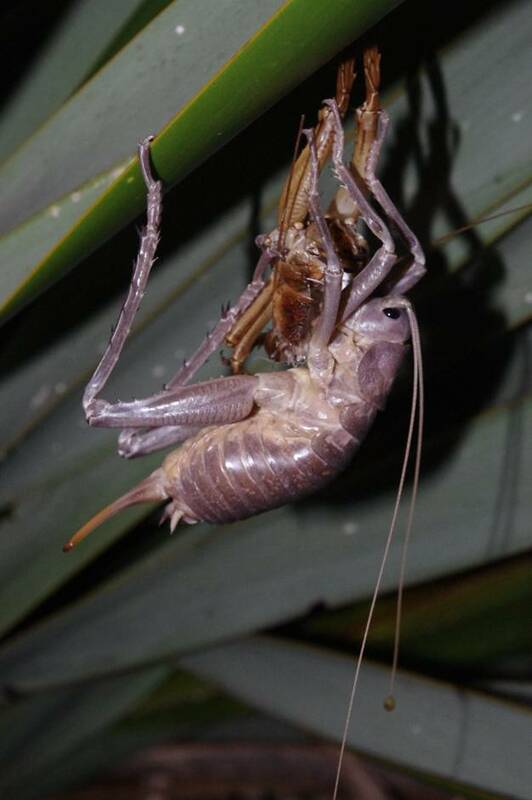 Poor Knights giant jumping weta (Gymnoplectron giganteum). 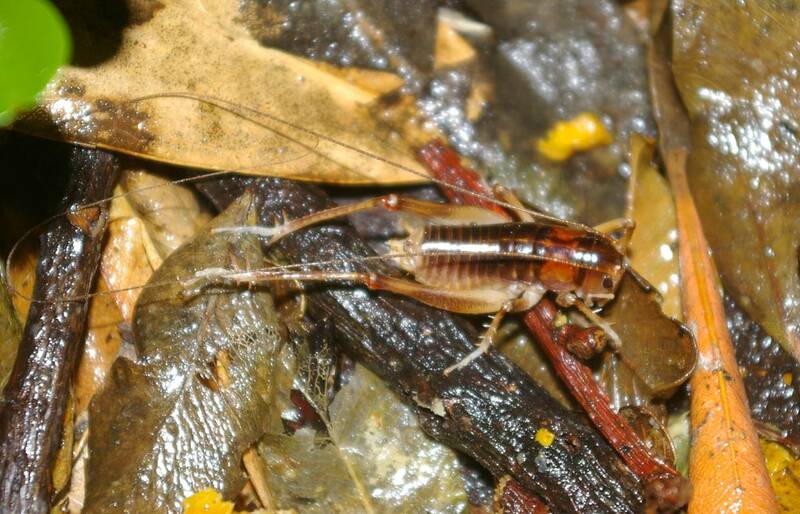 New Zealand’s largest jumping weta (or cave weta) is found only on the Poor Knights Islands, and has been measured at 45 cm from antenna tip to the tip of the hind leg (though the body makes up only 10% of this). We mainly saw them on damp nights, when they ran and jumped rapidly away from our lights. Poor Knights ground weta (Hemiandrus sp. aff. anomalus). This yet-to-be-named endemic species emerged from its burrows in large numbers on damp nights, otherwise few were seen. With a body-length of 35 mm, and shorter appendages, it is much smaller than its more famous cousins mentioned above. 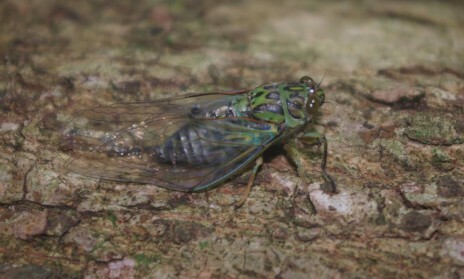 Clapping cicada (Amphipsalta cingulata). Common throughout the northern North Island and around Wellington, the clapping cicada spends most of its life as flightless nymphs living in the soil. The song of male clapping cicadas is one of the distinctive sounds of the New Zealand summer. Flax weevil (Anagotus fairburni). These large flightless weevils feed only on flax (harakeke and wharariki), with the adults emerging at night to chew on the tough, fibrous leaves. Formerly found throughout New Zealand, they are now confined to rodent-free habitats, including a few mountain tops. They are most readily found on pest-free islands off northern New Zealand, in Cook Strait, and in Fiordland. 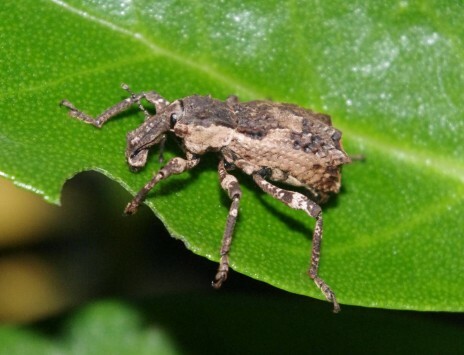 Turbott’s weevil (Anagotus turbotti). 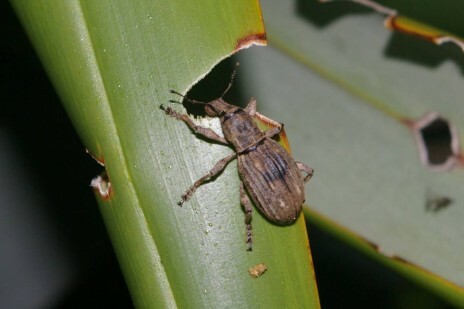 Slightly larger than its flax-eating relative, Turbott’s weevil has an even more restricted distribution – on the Poor Knights Islands, Three Kings Islands, and Muriwhenua Island in the Chickens Islands. All these islands have never had rats, whereas all the larger islands in the Hen & Chickens group had introduced Pacific rats (kiore) until they were eradicated from all but one of the islands. We saw about ten individuals, all at night, and mainly on karaka trunks. Three were seen feeding on ngaio leaves on the same bush, and one was on flax alongside its smaller cousins. 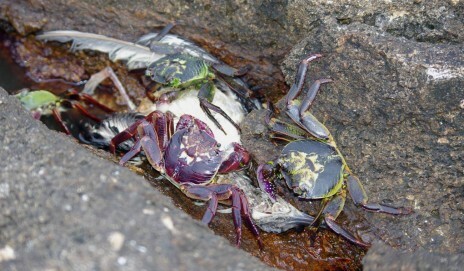 Purple rock crab (Leptograpsus variegatus). These large crabs are widely distributed in rocky intertidal areas in northern New Zealand, but are extraordinarily abundant on the Poor Knights Islands. The full protection they receive from the combined (land-based) nature reserve and adjoining marine reserve gives a hint of the impacts human hunting pressure has had on our marine organisms elsewhere. At several points on the wave platform on Aorangi Island I was able to count over 50 purple rock crabs as they scuttled away from me. They were typically hyper-sensitive to movement, but one group were so intent on feasting on a dead shearwater that they allowed my close approach. Another was seen feeding on a dead bellbird at a brackish water hole on the edge of the forest, but it is not known whether it caught the bird or scavenged its corpse. Acknowledgements: Thanks to Graeme Taylor of the Department of Conservation (DOC) for organising and leading the visit, and Bruce Marshall (Te Papa) and Gary Barker (Landcare Reasearch) for their thoughts on the giant slugs.